On Monday, April 23, 2018, a Toronto van mounted the sidewalk and ran over innocent pedestrians on Yonge Street south of Finch Avenue, killing 10 people and injuring 15 (News Article ). 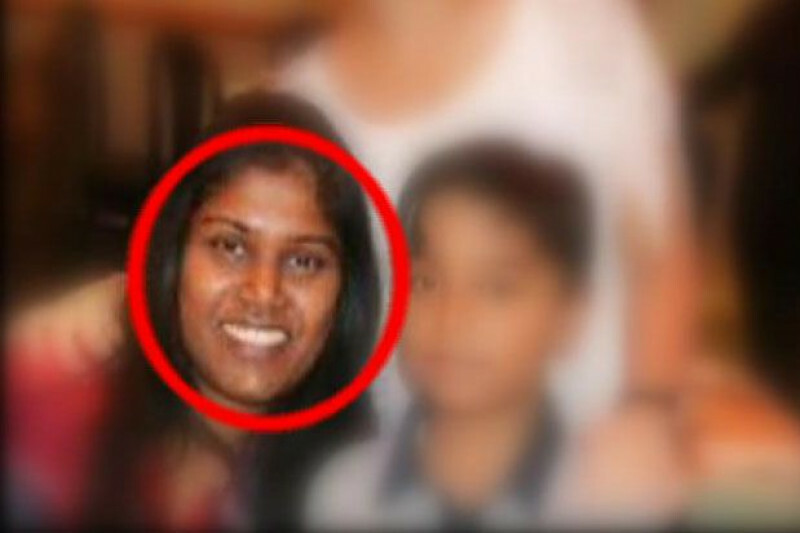 One of the victims of this horrific incident was Renuka Amarasinghe, single mother of 7-year old Diyon Amarasinghe, who is now stranded in Canada with no one to care for him. We refuse to accept such a fate, and would like to help Diyon secure a bright future! We will use this money to help Diyon with necessary expenses and set up a fund for his education. Diyon is a member of the Toronto Mahavihara Sunday School and has been in contact with members of the Lotus Youth Council previously. We are committed to setting up a trust fund for Diyon once the legal formalities are completed. Currently, Renuka and Diyon's lawyer is working on obtaining Renuka's death certificate for this purpose. Diyon is residing with a friend of Renuka's currently, and the Toronto Mahavihara is in contact with them at all times. The Lous Youth Council is affiliated to the Toronto Mahavihara which is a registered charity under Revenue Canada for over 20 years (Charity No.119266898RR0001). The Lotus Youth Council is working with Renuka's lawyer and the Toronto Mahvihara temple to ensure all this money is put to the use of Diyon's future. As for now, funeral arrangements for Renuka are being made. An update will be made here to indicate more information on this as we receive it. 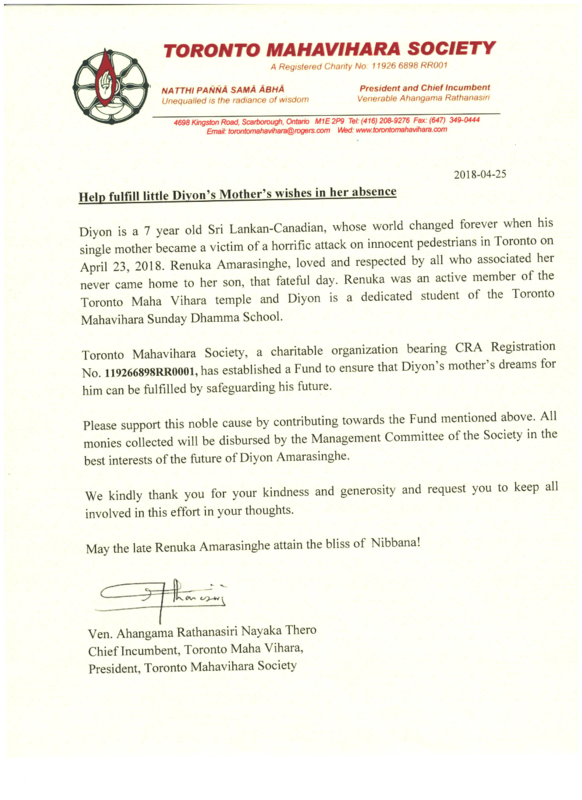 The Lotus Youth Council, together with the Ryerson University Sri Lankan Student Alliance, the University of Toronto Scarborough Sri Lankan Student Association, and Toronto Mahavihara, aims to raise this money for Diyon. Stay tuned for more updates as we navigate through this process! Firstly, we would like to acknowledge that we have far exceeded our fundraising goal! This is a testament to the kindness and generosity of the human spirit and we are grateful for all the support received thus far. Diyon is under the care of Renuka’s friend while matters are being settled and the Toronto Maha Vihara has been in frequent contact with them. 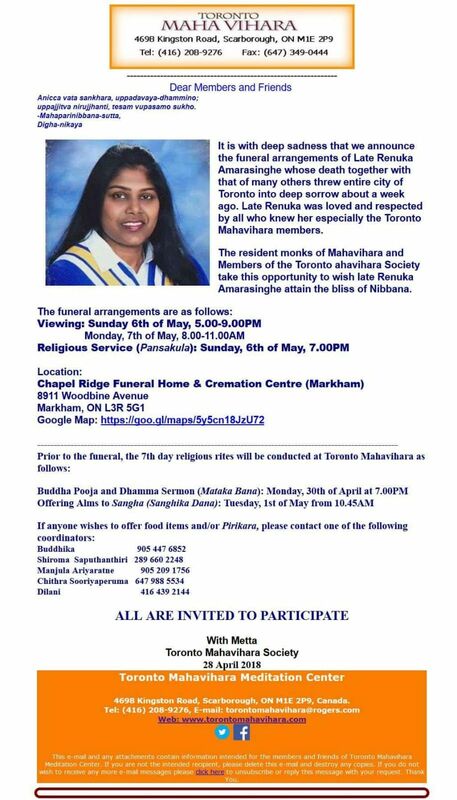 A meeting was held yesterday (April 27) at the Toronto Maha Vihara to discuss Renuka’s funeral arrangements and Diyon’s Trust Fund. There were many participants including from the Sri Lankan Tamil and Muslim communities, as well as Mr. U.L.M Jauhar, Consul General of Sri Lanka, Mr. Gary Anandasangaree’s , MP Scarborough-Rouge Park, representative and Toronto Victim Services staff. Renuka’s mother and sister are travelling from Sri Lanka to Toronto to attend Renuka’s funeral, with Toronto Victim Services arranging their travel. Preliminary discussions were held on establishing Diyon’s trust fund. General consensus was to appoint a Board of Trustees to oversee the responsible distribution of funds to Diyon’s guardians and Diyon, once he reaches the age of majority. The Board of Trustees will comprise of Toronto Maha Vihara and Lotus Youth Council members. Further discussion and steps, including the appointment of Trustees, will be taking place soon and is on-going. These are difficult times and issues to navigate. That is why we are taking the necessary time to discuss and plan the best and right course of action for all involved. We appreciate your patience and on-going support and will provide updates on our progress as we can. Tomorrow (April 29), the Toronto Maha Vihara Society members and the Lotus Youth Council will be joining the many who will be attending the City of Toronto Vigil and we encourage you to join us. Ms. Renuka Amarasinghe’s cremation took place today ( Monday, May 7,2018) at 12 pm. Over 1000 community members were present to pay respect and offer their final goodbyes. As of Monday May 7th, 2018, 12 noon, the fund is now officially closed. We would like to thank each and every one of the donors for their boundless generosity. We have far exceeded our goal, and this is a testament to the kindness and boundless generosity of the human spirit. The Legal Advisor of the Toronto Maha Vihara Society has started the process to establish a trust fund for Diyon. He has engaged the services of a legal expert. The funds collected will be held in trust and will be made available for Diyon’s living expenses and education. Further discussion and steps, including the appointment of Trustees, will be taking place soon and is on-going. The fundraising has been a joint effort by The Lotus Youth Council affiliated to the Toronto Maha Vihara society, the Ryerson University Sri Lankan Student Alliance, the University of Toronto Scarborough Sri Lankan Student Association, and the Toronto Maha Vihara. We, the Lotus Youth Council is a youth run organization where we come up with initiatives to raise money and donate to worthy causes. We focus on giving youth the ability to gain a leadership role at a young age to assist them in their futures. Visit our website for more information about us and our previous events! The Legal Advisor of the Toronto Maha Vihara Society has started the process to establish a trust fund for Diyon. He has engaged the services of a legal expert. The funds collected will be held in trust and will be made available for Diyon’s living expenses and education. Further discussion and steps, including the appointment of Trustees, will be taking place soon and is on-going. An update will be made on the page when this has been completed. Preliminary discussions were held on establishing Diyon’s trust fund. General consensus was to appoint a Board of Trustees to oversee the distribution of funds to Diyon’s guardians and Diyon, once he reaches the age of majority. The Board of Trustees will comprise of Toronto Maha Vihara and Lotus Youth Council members. Further discussion and steps, including the appointment of Trustees, will be taking place soon and is on-going. Thank you again for the kindness, generosity and support provided to Renuka and all the other victims of this tragedy!! We just updated the story with the latest information! We will keep posting updates as they come!